I fear we have not seen the last of the Shredder or Krang. You have corrupted my teaching, you have brought dishonor upon the noble Foot Clan. Now you will pay for your crimes. Remember, to be a true ninja you must become one with the shadows. Darkness gives the ninja power, while light reveals the ninja's presence. My sons! *sigh* My sons, If you are to become true ninja you must work harder. Your path in life will not be an easy one. The outside world will not be a friendly place for you. You four are different in ways the surface dwellers would never understand. To survive, you must master these skills I teach you. Ninjitsu powers of stealth and secrecy. You must become kage; shadow warriors. And you must never be discovered by the outside world. There is no place for excuses when you are the LEADER! Cody-san, thank you for your hospitality. Though this may be goodbye, we have forged a bound that will stand the tests of time. Past, present, and future. Remember your teachings, little ninja. New Updates! (4/21/2019) We've been working really hard on completing our membership system so you can submit quotes and keep track of them. Once this is complete in the coming weeks there will be a lot more quotes by Master Splinter and other authors. 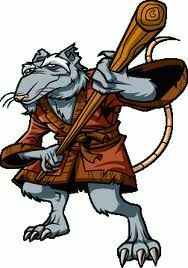 We've also changed the sorting on the site so you now see the latest Master Splinter quotes first. Our goal is to have the best Master Splinter quotes on the web!